US media group Tribune has filed for bankruptcy protection as it struggles with $13bn (£8.7bn) of debt. The owner of the Chicago Tribune and Los Angeles Times has been hit by the industry-wide slump in newspaper advertising revenues throughout 2008. 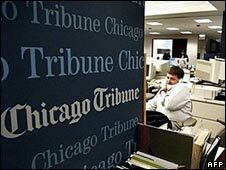 Tribune is owned by real estate billionaire Sam Zell, who borrowed heavily to buy the firm in June 2007. Under US Chapter 11 bankruptcy protection law a firm can keep trading while it aims to sort out its finances. Tribune is also the owner of the Chicago Cubs baseball team and the club's famous Wrigley Field stadium, although neither are included in the bankruptcy protection move. It is continuing efforts to sell both. Tribune said the firm's newspapers and TV stations would continue to operate as normal. Analysts say that most of the debt was created by Mr Zell's purchase of the company. While the next major interest payment is not said to be due until June 2009, Tribune is said to be at risk of missing certain financial targets set by the banks. Tribune said its main creditors included JP Morgan Chase and Merrill Lynch. "This restructuring focuses on our debt, not on our operations," said Mr Zell. "We believe that this restructuring will bring the level of our debt in line with current economic realities, and will take pressure off our operations." Tribune is America's third-largest newspaper group by circulation. It also runs 23 television stations.